The American College of Obstetricians and Gynecologists (ACOG) has issued a new practice bulletin on the management of gestational diabetes mellitus. The document «primarily serves as an update, to incorporate new clinical trials and whether or not they shed any additional light or would change management», says one of the authors, Wanda K. Nicholson, MD, from the University of North Carolina at Chapel Hill. The bottom line is that there is «no change on what was previously recommended», she told Medscape Medical News. «The new studies that have been done since the last bulletin… reconfirm what the management has been, but we also identify areas or gaps in our knowledge for future studies», she noted. The bulletin is published in the August issue of Obstetrics _ampersent_ Gynecology(2013). Approximately 7 % of the 4 million women who give birth each year in the United States develop gestational diabetes. The condition is increasing as obesity and older age at pregnancy become more common. Other risk factors include having a family history of type 2 diabetes or belonging to an ethnic group at increased risk for the condition (such as Hispanic, Native American, South or East Asian, African American, or Pacific Islands descent). Women with gestational diabetes are at higher risk for gestational hypertension, preeclampsia, and cesarean delivery and associated potential morbidities, and, of note, have a 7-fold increased risk of developing diabetes later in life. The offspring of women with gestational diabetes are also at increased risk for macrosomia, neonatal hypoglycemia, hyperbilirubinemia, operative delivery, shoulder dystocia, and birth trauma. The new ACOG bulletin, together with draft guidance from the US Preventive Services Task Force issued recently, support the conclusions of a Eunice Kennedy Shriver National Institute of Child Health and Human Development Consensus Conference earlier this year, with regard to the diagnosis of gestational diabetes, which they state should remain a 2-step approach. Despite several advantages of 1-step approaches and their widespread use outside the United States, more research is needed before any changes are made to the 2-step diagnostic approach that is the current US standard, they all conclude. One of the concerns about a 1-step approach is that it is anticipated to increase the frequency of diagnosis of gestational diabetes 2- to 3-fold. The 2-step approach to testing is based on first screening with the administration of 50 g of an oral glucose solution followed by a 1-hour venous glucose determination. Those women meeting or exceeding the screening threshold undergo a 100-g, 3-hour diagnostic oral glucose tolerance test (OGTT). This testing is normally done between 24 and 28 weeks’ gestation in all pregnant women. «ACOG supports this recommendation (to keep a 2-step approach) and recommends that before the testing approach and diagnostic criteria for gestational diabetes are changed, implications of such changes should be studied», the new bulletin notes. In women in whom gestational diabetes is diagnosed — using a blood glucose level of either 135 or 140 mg/dL, with factors such as community prevalence rates of gestational diabetes determining the cutoff — initial management should be nutritional counseling by a registered dietitian, if possible, and advice on a moderate exercise program. 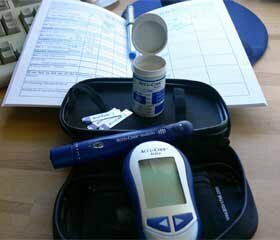 Once a woman with gestational diabetes begins nutrition therapy, surveillance of blood glucose levels is required to be certain that glycemic control has been established. When target glucose levels cannot be consistently achieved through nutrition and exercise therapy, pharmacologic treatment is recommended, the bulletin states. «However, a systematic review found no conclusive evidence for the threshold value at which clinicians should start medical therapy», it notes. When pharmacologic treatment of gestational diabetes is indicated, insulin and oral medications are equivalent in efficacy, it advises «and either can be an appropriate first-line therapy». After delivery of the baby, the carbohydrate into-lerance of gestational diabetes frequently resolves, although up to one third of affected women will have diabetes or impaired glucose metabolism at postpartum screening, which is recommended at 6 to 12 weeks after delivery. ACOG thus proposes a new performance measure, Dr. Nicholson notes: the percentage of women in whom gestational diabetes is diagnosed who have postpartum screening for type 2 diabetes.